The Piedmont extends southwestward from New York City to Montgomery, Alabama, in a swath that is bordered on the east by the Coastal Plain and on the west by the Appalachian Mountains. The Virginia Piedmont is roughly triangular in shape, extending from a narrow band in northern Virginia to a width of 150 miles at the southern Virginia border. Although it was once mostly hardwood forest, centuries of human influence have converted the Piedmont to a mix of agriculture, abandoned farmland, forest, and suburban development. Often overlooked in its importance to birds, the Piedmont provides valuable nesting, migration, and wintering habitats that are scarce in other parts of the state. 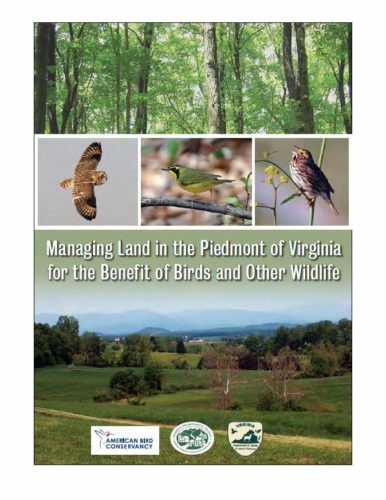 Approximately 140 species of birds breed in the mid-Atlantic Piedmont. Data show that populations of many of these species have declined in recent decades. Habitat loss and degradation are the most important factors causing these declines. Suburban and agricultural development has eliminated much of the region’s hardwood forest, and non-native plants and poor management have impaired much of what remains. Non-native grasses of little value to most birds dominate pastures, and early mowing for hay destroys the nests of those few that attempt to breed there. Farm modernization and increasing pesticide use have turned agricultural lands into wastelands for birds, in part by eliminating many brushy fence lines, ditches, and road banks that formerly provided valuable edge habitat for nesting and foraging.